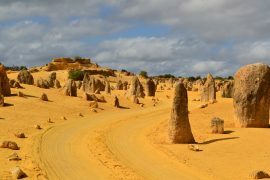 It’s Australia that’s famous for its larger-than-life roadside attractions: its long, dusty roads are littered with giant prawns, burgers, dinosaurs and more to amuse, entertain and baffle outback tourists. 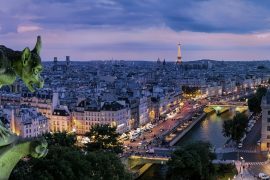 No-one really knows how the trend started, but it seems intuitive: where there’s bored car passengers and lots of space, why not build something massive that’ll fill the landscape and their thoughts for a little while? It’s not just Oz that’s mad for anything oversized, either. America’s typically bigger, better and more brash than other countries, and don’t buck this trend when it comes to brilliantly barmy roadside attractions. 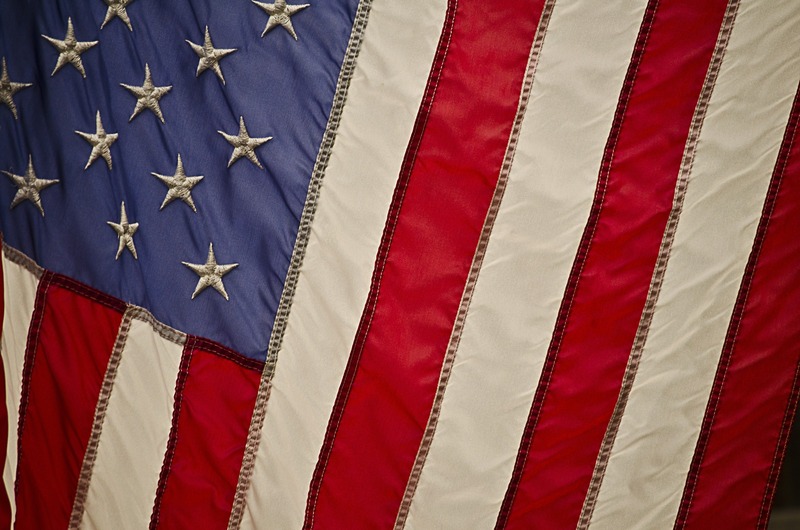 If you’re planning on traveling to the States any time soon, why not seek a few out? 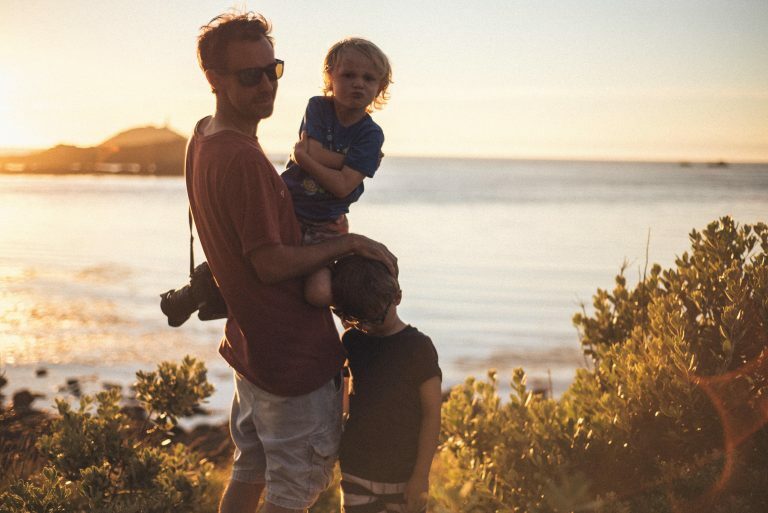 Grab yourself a pair of binoculars, a map, and get a quote online for car insurance; then, prepare to feel very small indeed. To get you started, below is a list of 10 of the biggest and best of America’s roads. 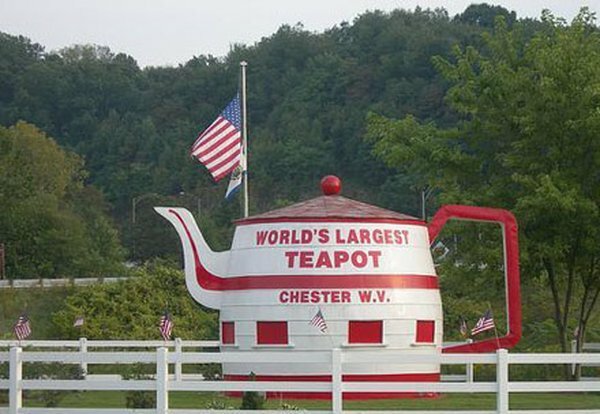 Built in 1922 as a not-so-solemn reminder of a bribery scandal that rocked the White House, this giant red and white teapot with windows and a door is actually weirdly cute. And, until recently, it was a fully functioning service station. 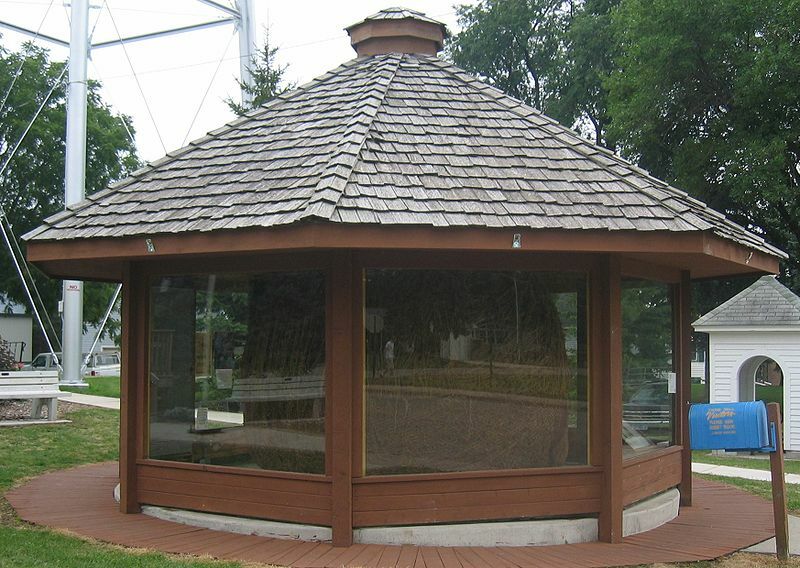 When Francis Johnson of Minnesota built a twine ball as big as a bull, the community of Cawker, Kansas saw it as a knotty challenge and started to build their own. Every August there’s a Twine-a-thon where they add to their stringy orb; it currently boasts a circumference of 40ft. The Jimmy Carter Peanut is a 13ft statue of an unshelled monkey nut with an unnervingly big grin. The USA’s 39th president was a peanut farmer before taking office and this statue was originally made to celebrate a visit to Indiana by the touring Carter. Now, it sits outside a local store in his hometown of Plains. 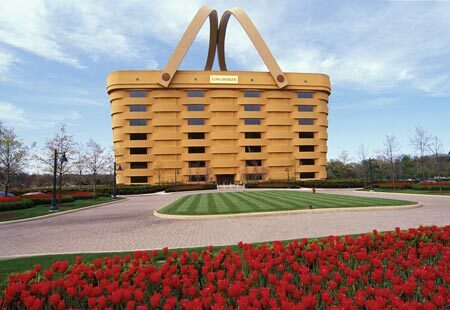 The offices of Longaberger Basket Co. are the stuff of Yogi Bear’s dreams: the seven story building which houses them is shaped like one of the company’s iconic products, complete with heated handles to prevent frost. 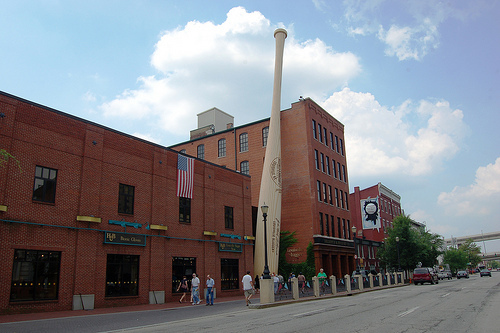 Louisville is famous for its ‘sluggers’, so it’s no surprise that it’s the home of the largest bat on record: a striking 120ft scale model of Babe Ruth’s famous weapon of choice. 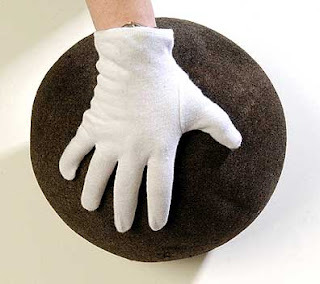 Henry Coffer has been cutting coiffures for over fifty years, and has the hairball to prove it. If you want to become a part of history, ask for a $10 haircut; your quiff’s clippings will be contributed to the creepy orb. Not actually made of paper and impossible to drink from, but still. 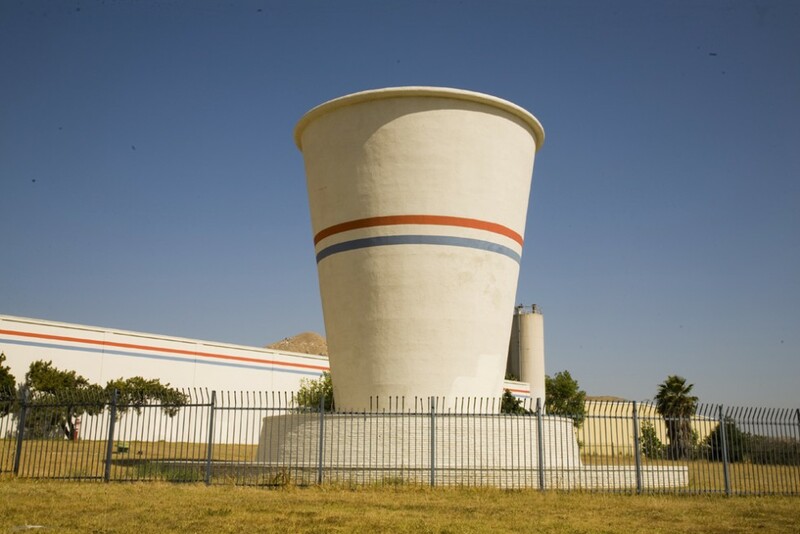 This concrete behemoth used to grace the front of a Dixie cup factory; now, its stripy form has been abandoned to tower somewhat forlornly over the road in Riverside, CA. It took over 40 hours of volunteer crafting to build this behemoth amongst pans. It’s still not the biggest in the country (it’s just 3 inches short of that honour) but anything that’s capable of frying 88lbs of bacon at once is worth a look. 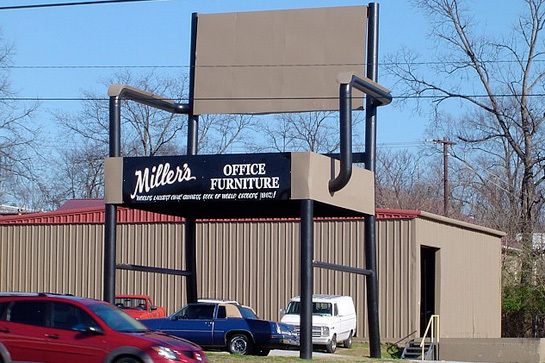 The eighties was the decade of big hair; maybe Miller’s Office Furniture misheard what the trend was when they built this 33ft beauty? 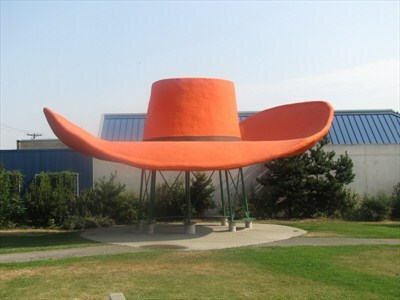 There’s nothing more American than a pair of cowboy boots and a 10 gallon Stetson… Unless it’s a huge pair of boots and a hat than can hold about 500 gallons, settled in the scenic Oxbow Park, WN. Kids can enjoy a nearby play area, too! 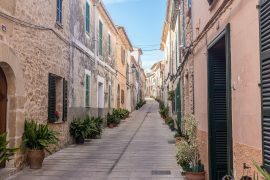 We make it our mission to road trip to "world's largests" like this on our travels throughout the U.S. 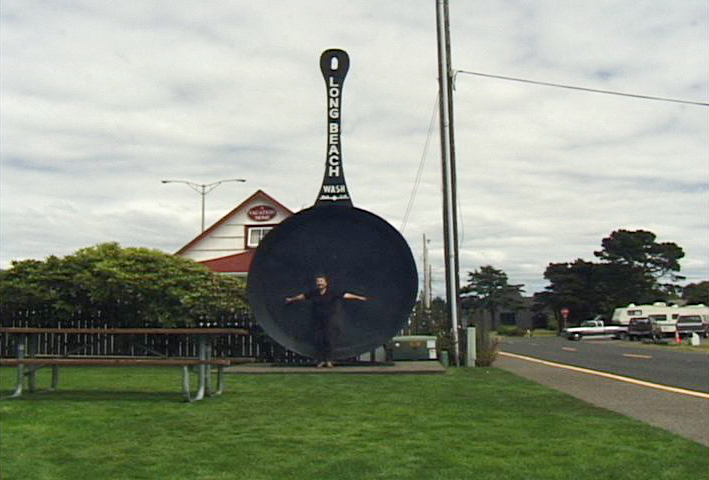 So far, we've seen the world's largest bowling pin, apple, pancake griddle, kaleidoscope, globe, and several others! you missed the worlds largest ketsup bottle at the Brooks ketsup plant in Caseyville , Il. and the largest Vess Bottle in St. Louis, MO.